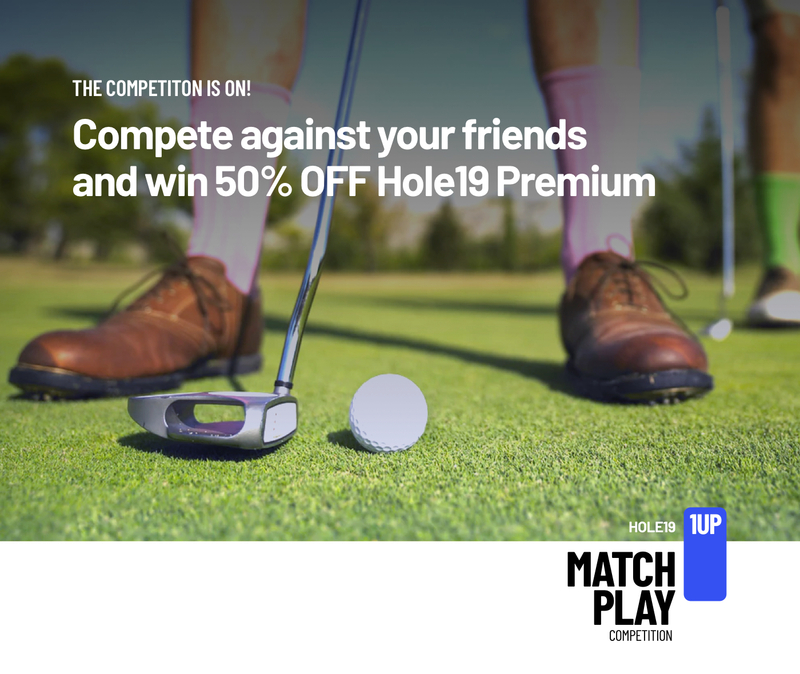 H19 Match Play Competition: Get 50% OFF Premium! The Ryder Cup might be over but we have some great golf news for you! To celebrate the launch of our newest premium feature we decided to run the first Hole19 competition that is open to golfers from all over the world! In our new competition, you can play against your golf buddies hole-by-hole with each of you having the chance to win a massive 50% discount on Hole19 Premium (via Hole19 Website)! Keep reading below to see the full competition terms. Challenge your friends and win! 1. All players must have a Hole19 account! If you’re not Premium yet, click here to start your subscription via website with the MATCHPLAY promo code. Just like that, you'll get 20% off on your first installment (you're only charged after the 30-days free trial if you still haven’t used it). 2. On the 12th, 13th and 14th of October, gather your friends together and compete against each other! You can play 1-on-1, 2-on-1 or 2-on-2. All Hole19 golfers can get involved. Then, it will be just a matter of letting your competitive spirit take over and may the best golfer win! 3. The winner(s) of each 'Match Play' round will receive a 50% discount on Premium (to be redeemed on the Hole19 Website). - At least one player must be Premium in order to use the Match Play feature and save the round. - If you are still on the trial period via the Hole19 Website, the discount will be applied on your first installment. If you have already paid for your subscription, the discount will be applied on your next renewal. If you started your subscription with the MATCHPLAY promo code and win, it means that you will benefit from an additional 50% discount!! Start your round, turn the Match Play option on and click on the 'Add' button. Select all players from your Buddies List. Click on 'Start Round - MATCH PLAY'. Feeling like you can win a Match Play round? Challenge your friends and find out! Don’t give up that easily! There are no limits on the number of Match Play rounds you can play in order to win, as long as you challenge different Hole19 members! Just bear in mind that you can only win once. Wait! There's more... No luck on the golf course this time? It can still be your lucky day outside the course! We will randomly choose three golfers from those who don’t win any match and send them some pretty cool golf gear. The competition is open to all Hole19 members, starting Friday 12th and ending Sunday 14th, 2018. The winners will be notified October 16th. In order to start a match play round, at least one golfer has to be on a Hole19 Premium subscription. The match play round has to be initiated and tracked on iOS devices, using the Match Play mode. All players must be added from the Hole19 database/buddies list. If a round ends tied, there are no winners for this match. c) It is finished/saved with valid scores. d) The GPS matches the golf course location where the round is played. e) All players are added from the Hole19 Buddies list. a) 1-on-1. Only one golfer gets to win. b) 2-on-1. Either 2 or 1 will get the discount. c) 2-on-2. There will be 2 winners. 3. Android users can also participate. The match play round has to be initiated on any iOS device from any team member. Golfers on a Premium trial will benefit from the 50% discount on their first installment. Golfers with active Premium subscriptions will get 50% discount on their next renewal. Golfers who subscribed to Premium via App Store or Play Store will receive a promo code for 50% off on a Web Subscription (learn more here). Golfers that don’t win a match can still challenge different opponents on the same conditions mentioned above and, by winning the new match, they’ll receive the special discount. A single golfer can only win the 50% discount once, regardless of the number of match play rounds won. Additional prizes will be given randomly to users that played authentic match play rounds without winning any of them. Hole19 reserves the right, in its sole discretion, to disqualify any round that tampers with the entry process. Visit our Help Center to learn more about the Match Play feature.